When you think of a “Startup Founder,” who comes to mind? Mark Zuckerberg (Facebook)? Steve Jobs (Apple)? Ben Silbermman (Pinterest)? Besides starting amazingly successful companies, these founders all have one thing in common: they are white males. There’s a new diversity bully in town; it is the Old Boy’s Club’s little brother, the Young Brogrammer’s Club. How long will it take until we start seeing the faces of Sophia Amoruso (Nasty Gal & Girlboss Media), Kathy Hughes (Radio One), Julia Hartz (Eventbrite), Sarah Blakely (Spanx), Oprah Winfrey (need I say more?) as the startup norm, and stop calling them “unicorns.” This isn’t to take anything away from the successful men in the industry. You do you, dudes! But, there’s plenty of room for us gals, too. So move on over and make some space, because we are coming. According to Forbes’ Entrepreneur, women owned businesses have been growing 1.5 times faster than other small businesses. However female founded companies only make up 30% of the workforce. How do we fix this to level out the playing field? Ladies, take that idea you’ve been dreaming of and make it happen. I mean it, put on your bosslady britches and just do it. Back in June, I was reading my daily email from theSkimm, which is always part of my morning routine. For those who aren’t current Skimm’rs, theSkimm’s free subscription makes it unbelievably easy to stay in the loop of international news, all in a short and simple daily email. The also have an app and daily podcast that help you stay on top of worldly happenings. In this particular email, they announced that they would be hosting a competition for female entrepreneurs, and I submitted an application to be part of the contest. The founders of theSkimm were hosting the “Get Off The Couch Competition,” aptly themed due to the fact that theSkimm founders launched their company from their couch five years ago. The concept of Giv-Now was an idea that I carried with me in the back of my head for quite a while, but didn’t know how to go about making it a reality. I always thought, “There must be an easier way to volunteer!” and was inspired by my own experience of struggling to find local volunteer opportunities that I was qualified for. Thus, the idea was born for a platform that connects charity organizations to volunteers, provides mobile volunteer training, and allows for-profit orgs to get involved as sponsors. I applied to the competition with the hopes of pitching Giv-Now, and was soon after shocked to find I had been selected. I had some serious imposter syndrome going on. They picked me? Really? The filming experience was unreal. The cast of the first two episodes were all housed in the same room during the shoot, and while we waited for our filming segments, we swapped business tips and ideas, we ate lunch together, and our conversations spanned from politics to online dating. Not only was this a great opportunity to share the word about our products and ideas, but to meet other amazing female entrepreneurs. If you’re interested in seeing my pitch, you can head here to view my episode…no spoiler alerts, I’m the third and final pitch. Short on time? No worries, this episode is hosted on Facebook’s new WATCH platform, which is solely comprised of short videos, and the whole episode is less than seven minutes long. Want to learn more? Head over to the Giv-Now site or Facebook page. Why do you think this will be successful? How will this business scale in 5 years? How are you marketing your product? Why did you choose this logo design? Doing your spiel in front of your mirror at home won’t cut it; it’s quite different pitching to real people. Test your pitch on friends and family, or join a supportive local meetup group or online community like Fierce Girls Entrepreneurs Club, where you can practice your pitch amongst like minded people. Your pitch isn’t just about listing facts and figures to your audience. You should try make a personal connection with them, so they see themselves with your product, making it more tangible and relatable to them. If possible, show, don’t tell. Your pitch should be as interactive as possible, and let your audience experience what you’re selling, or at least allow them to imagine what it would be like. If you must tell, speak in numbers. Share your current sales figures, number of subscribers, profit margins, etc. Even if your audience has a negative reaction, remain confident and level-headed. Never let them see you sweat, and never raise your voice or cop an attitude if you don’t get the reaction you were hoping for. Set a time limit, and stick to it. Most competitions have a time limit of 5-10 minutes, or 1-3 minutes for an elevator pitch. If pitching in a meeting, you may have a 30 minute time slot, but your pitch shouldn’t take up the whole meeting. Be respectful of your audience’s time, and pace yourself. We tend to rush when we are nervous, so it’s okay if it sounds like you’re going slow in your head, your audience will most likely hear a normal speaking rate. Hold your head up high and push your shoulders back and be proud to talk about your business. Keep your legs relaxed, and don’t lock your knees or risk passing out. Don’t raise your pitch at the end of each sentence like you’re asking a question. You are declaring a statement. Do so confidently, and keep your tone low and steady. Resist the Minnie Mouse impressions. Be able to explain exactly what makes your idea different and better than what’s already out there. If you don’t have a differentiating factor, then you don’t really even have a business. Don’t just dress for success, dress to close. Shine your shoes, brush your hair, and steam out every last wrinkle. Ensure your clothing choice fits well and isn’t a distraction. Anything that you need to constantly tug, adjust, or fluff needs to stay in your closet. If you play with your hair when nervous (like yours truly), I suggest wearing your hair up. Fun fact: If your hair is off of your face, you appear more trustworthy. If you have any questions about volunteering with Giv-Now or becoming a Fierce Girl Entrepreneur to help perfect your pitch, please get in touch. 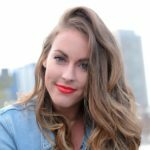 Kaitlin Dunning is a marketing consultant, entrepreneur, and digital illustrator. She currently resides in Washington, D.C. and has had the pleasure of calling Tampa, London, and NYC home. She is passionate about people (including the four-legged furry variety) and digital design, firmly believing that when you combine art and technology, you can truly create magic. Thanks for your advise. Waiting for your guidance about choosing clothes for female!